Let us guide you from arid desert to rich river delta and through incredible cultures. This is the land of the Masai Mara, of wildebeest and zebras migrating in their millions with the great predators of Africa following in their wake. But Kenya is also home to the red elephants of Tsavo, to Amboseli elephant families in the shadow of Mt Kilimanjaro and to the massed millions of pink flamingos stepping daintily through lake shallows. Africa is the last great wilderness. The Masai Mara is perhaps the most filmed safari area in Africa and the setting for Big Cat Diaries and Disney’s Lion King among others. It is the setting in which the Great Migration takes place. 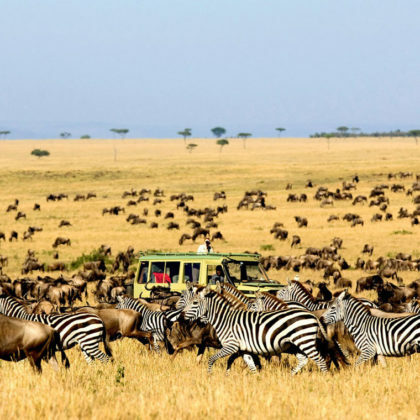 It forms part of a much larger ecosystem which is continuous with the Serengeti National Park in Tanzania. 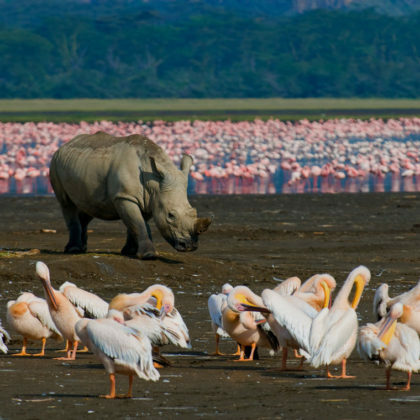 Lake Nakuru is the scene of one of the greatest birding spectacles on Earth, where thousands or even over a million Greater and Lesser flamingos gather to feed on the algae and shrimps on this soda lake. It is one of the last refuges of the endangered black and white rhinoceros. Commonly seen animals include Zebra, buffalo and giraffe. 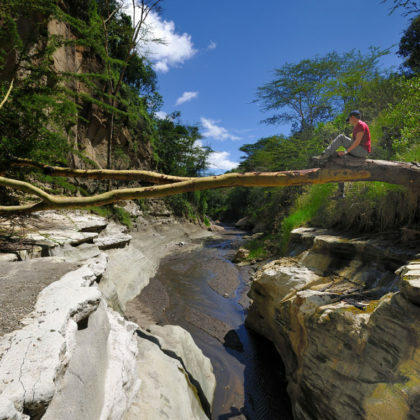 This Park is known for its varied landscape such as Hells Gate Gorge which offers great hiking and climbing opportunities. The Park takes its name from a number of natural hot springs and geysers that gush forth steam through ‘hells gates’ in the earth’s crust. It is one of the only parks in Kenya where visitors can explore on foot and by bicycle. Watamu Beach features white sand and offshore coral formations arranged in different bays which are protected as part of the Watamu Marine National Park. The Marine Park is considered one of the best snorkelling and diving areas on the coast of East Africa. It is also rated the third best beach in Africa. 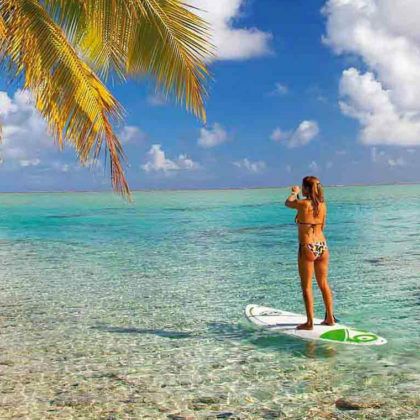 The region also offers water based adventures sports. The Tsavo East and Tsavo West National Parks together form one of the largest game conservation areas in the world. 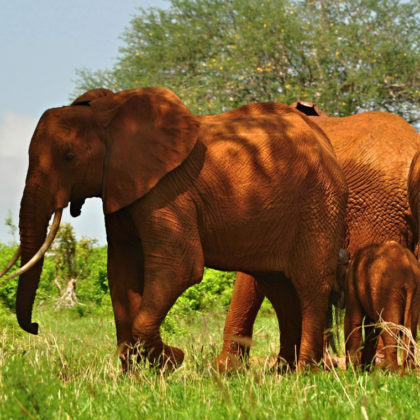 Tsavo is known for its short-maned lions but the undisputed highlight is the large herds of elephants that call the park home, often coloured a reddish brown from having a mud bath in the regions red earth. 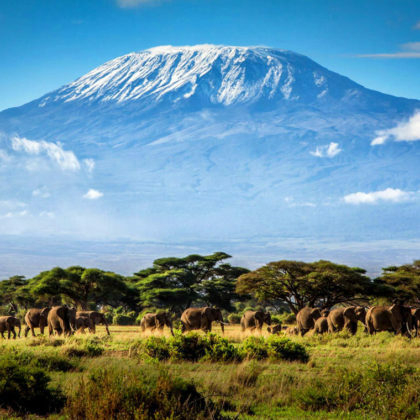 Amboseli is famous for its iconic pictures of elephants and other wildlife with snow-capped Mount Kilimanjaro rising up majestically in the background. The elephants of Amboseli are known to have some of the biggest tusks remaining in the world. 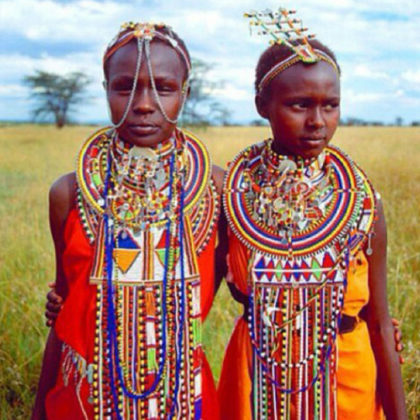 One of the most iconic tribes of Africa have to be the Maasai people with their red Shukas (wraps) and the women are famous for their beautiful beadwork jewellery. They are one of the very few tribes who have retained most of their traditions, lifestyle and lore. In common with the wildlife with which they co-exist, the Maasai need a lot of land and are semi-nomadic and pastoral: they live by herding cattle and goats.